K-6274-C11-BN Finish: Vibrant Brushed Nickel Pictured in Polished Chrome Features: -Bathroom faucet.-Brass valve bodies.-Widespread.-Articulating spout.-Quarter turn washerless ceramic disc valves.-Integral sprayhead.-Touch activated drain with tailpiece and overflow.-1.5 Gallon per minute maximum flow rate.-ADA compliant.-ASME A112.18.1 listed.-CSA certified.-ANSI A117.1 listed.-Watersense certified.-Spout reach: 2'' to 6''. 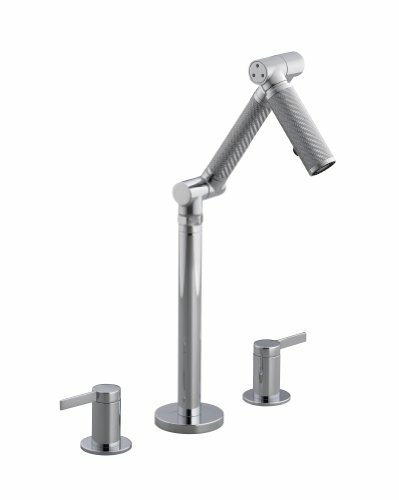 Options: -Available in Vibrant Brushed Nickel or Polished Chrome finish. Construction: -Metal and carbon fiber construction. 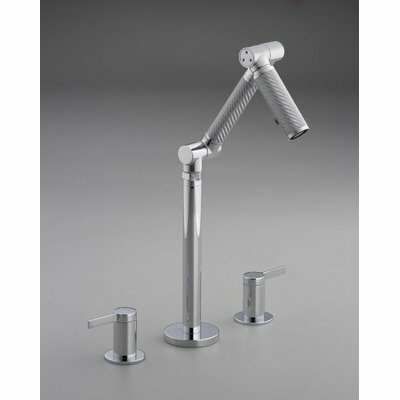 Dimensions: -Overall dimensions: 13.188'' H x 16'' W. Collection: -Karbon collection.